One of Mary’s first investments when she got out of college was a sewing machine and she’s been using it ever since. Of late, it’s gotten a bit sporadic and the foot control seemed to be at fault. The symptoms were that the foot control required too much travel (equivalently: foot pressure) to get up to speed, it started abruptly (poor speed regulation), and sometimes cut out without warning. So I took it apart to see what I could do. 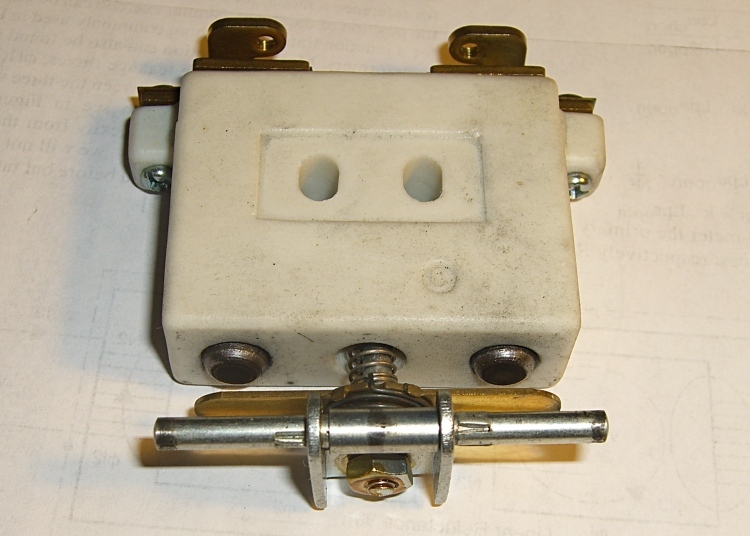 Two pins in the side hold the top cover in place and serve as pivots. Loosen the two visible screws in the center of two of the bottom feet, hold the top half of the case down, and slide the pins out. A wedge on the top half presses down on the middle of the steel bar, pressing it into the rheostat. A dab of silicone lube on the wedge greatly improved that action. The speed control itself is brutally simple: a carbon-pile rheostat in series with the 120 VAC 1 A sewing machine motor. The ceramic case and heatsink tab tell you that things get pretty toasty inside that Bakelite case. Disassembly is obvious, which is one of the nice things about old electrical gadgets: you can puzzle out how they work and how the parts fit together just by looking. 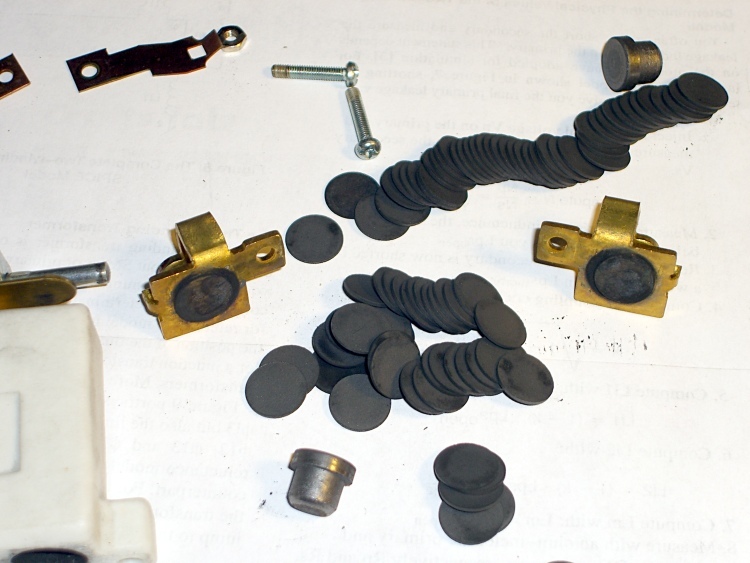 A slew of graphite disks slides out from two cylindrical tunnels in the ceramic case, followed by two graphite contact buttons. The brass fittings on the front have carbon dust on their raised surfaces, but are basically just stamped & machined metal parts. No fancy electronics, no firmware, just a high-power (and utterly non-inductive!) carbon variable resistor. With no pressure on the foot control, there’s a generous gap between the contact bar on the back surface and the two graphite buttons sticking out of the ceramic case. There’s no way for the contacts to close by shaking or accident. A bit more foot pressure connects those two buttons through the shorting bar across the back. Light pressure on the graphite disks means a relatively high resistance, on the order of several hundred ohms, and relatively low current to the motor. Of course, that also means the motor has poor starting torque, but … a sewing machine doesn’t need a lot of torque. Increasing foot pressure squeezes the disks together and decreases the resistance. It drops to a few tens of ohms, perhaps lower, but it’s hard to get a stable measurement. The motor averages all that out and trundles along at a reasonably steady pace. Finally, the brass disk in the central case tunnel shorts the tabs on the two brass end contacts and lets the motor run at full speed. Increasing the foot pressure beyond that point doesn’t change anything; the spring-loaded shaft can’t deform the tabs. The steel shaft and contact disk can short one or the other of the two piles, but that just decreases the already small resistance by about half. That might give the motor a speed boost instantly before jumping to full speed. As nearly as I can tell, the carbon disks evaporated over the decades, as the piles seems quite loose and required a lot of foot motion to reach the first contact point. I lathe-turned a pair of brass disks about three wafers thick, so that they’d take up the empty space in the piles. I also filed the brass end fittings flat so that they contact the disks over more of their surface. The first two disks looked like they had hot spots: loose carbon collected in the areas where the contacts didn’t quite touch them. I doubt that actually improved anything, but it’s the thought that counts. The spacers worked reasonably well, although I wound up removing one graphite disk from each pile to ensure the full-speed contacts would close properly. They’re in a small plastic bag tucked under the aluminum heatsink tab, where they can’t get lost. With any luck, the bag won’t melt around them. A few days later, the sewing machine stopped working entirely. The foot control itself seemed to be working correctly, but a bit of poking around showed that the cord had a broken conductor just outside the strain relief. I cut the cord off at the strain relief, hacksawed the strain relief apart, then rewired it. The cord is now four inches shorter and everything works fine again. I think this would be a nice candidate for a PWM controller, but then I’d have to shoehorn all that circuitry into the base of the sewing machine or add another cord to the foot control. Ptui, this works well enough. Memo to Self: Replace the entire cord next time. This entry was posted on 2009-03-10, 07:43 and is filed under Electronics Workbench, Home Ec, Machine Shop. You can follow any responses to this entry through RSS 2.0. Both comments and pings are currently closed. Hi, Thanks for the posting. I picked up two of these recently out of curiosity. you gave some information that may be useful in their disection or adaption?. D.D. Carbon piles aren’t good for much other than driving old sewing machines: we have much better ways of doing speed control these days! I cleaned the contacts inside that control again and I fear it’s living on borrowed time. The sewing machine itself still works fine: it’s a well-used and much-loved tool. Loving the blog/website, I will be having a look around shortly.. the wife is using an older frister-rossman sewing machine as I type and the foot pedal allows it to be either on full speed or off with very little in between. I took the foot pedal apart expecting to see some kind of variable resistor. 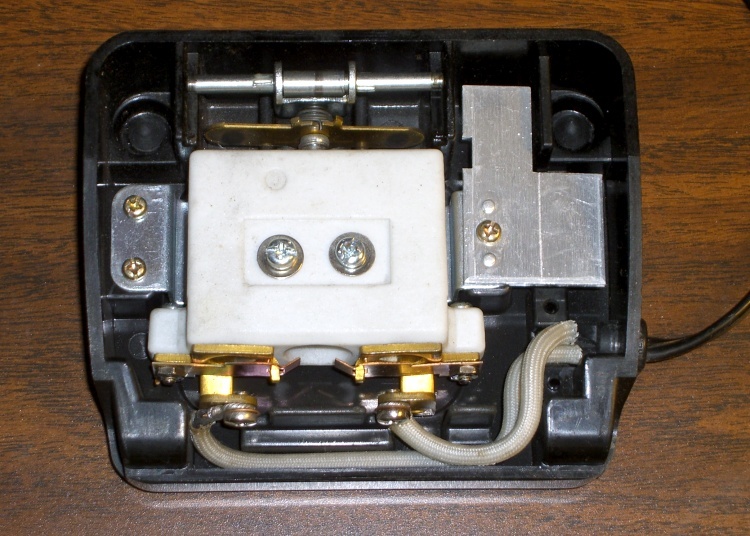 I have never seen a carbon pile rheostat, the only kind I have seen are the wire-coil type. Would taking out the disks and cleaning them improve things?i imagine they are probably coved in carbon dust. Well, they are pure carbon, so some carbon dust probably doesn’t matter: it’s conductive, after all. What’s more likely is that the disks have each gotten slightly thinner over the years (decades? ), so that the stack doesn’t actually conduct any current until the full-speed-ahead switch closes. If you add a conductive spacer (similar to the brass disks I made) to the stacks, that should help, as will all the usual contact cleaning and continuity checking and suchlike. Thanks for the info Ed! I opened it up again to have a look and check that it wasn’t going ‘full-speed-ahead’ mode but it reaches the high speed just as the leaf springs start pushing on the rheostat (! ).By adding a spacer I think it would probably make it worse by increasing pressure on the discs and probably wearing the them faster. Am I wrong? Maybe they have just worn so thin there’s little potential for resistance in the first place (you do have to push the pedal quite a way to get it to start in the first place). I regards to dust I thought that it might allow for a lower resistance if it’s all packed in there in between the disks closing up gaps, more surface area etc. I wondered about lowering the power available to the motor but then all that would achieve was a lower top speed, not a slower start. Any suggestions? Is retrofitting the pedal an option? Thanks Ed! With this one, a coil spring does the speed control. 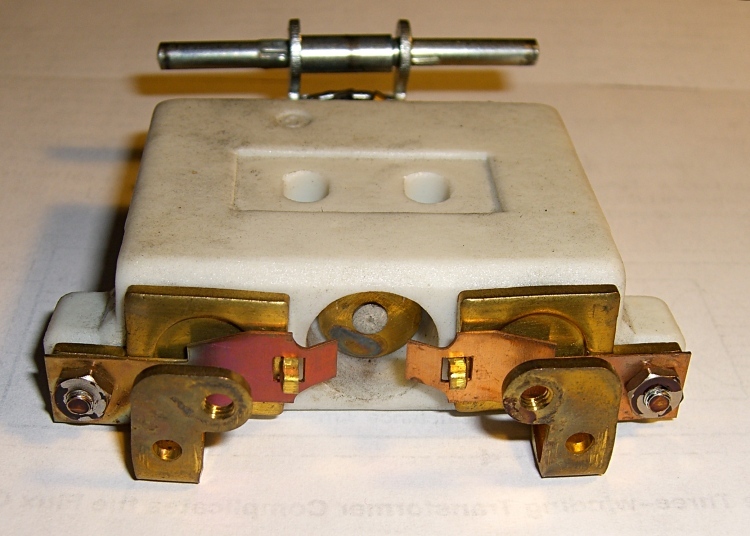 The foot pedal pushes on the steel rod that compresses the spring until the brass bar connects the two carbon stacks. At that point the motor runs at low speed; it revs up as pressure increases on the stacks and the spring continues to compress. Eventually, those two brass prongs in the front touch the washer that’s emerging through the middle tunnel of the ceramic housing, which shorts around the stacks and runs the motor at full speed. Measure the resistance of the stacks (unplug it first!) with no pressure, then with increasing pressure. Measure the resistance across the whole assembly with increasing pressure and compare it with the stack resistance; that may show that the stacks aren’t making contact at all or that something’s shorting them out. Many thanks for posting this! The pedal of my old inherited Kenmore fell down from my 4year old’s little hands, and the outside shell is broken. I can repair it but I had a loose metal piece I didn’t know where to placed, now I know where it goes! now I know where it goes! Let the kid take more stuff apart… then “help” put it back together. After a while, you can sit back and watch! Nope, each disk is an entirely separate item; you’re seeing carbon dust burned onto those brass terminals. Just buff the crud off and put a different disk in that position: you want a good, clean connection!